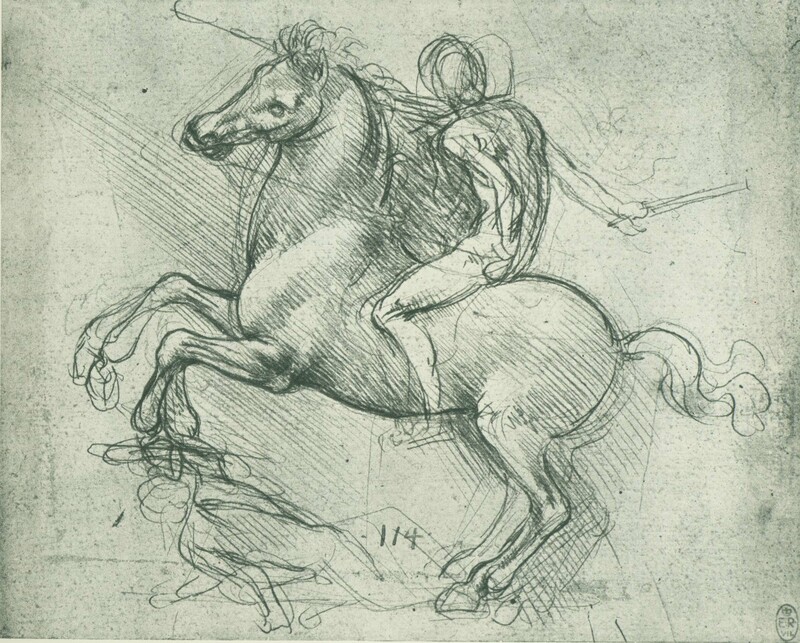 Could Leonardo da Vinci draw, really? You know at first glance that this is a fine drawing. There are three possible reasons why you might come to that conclusion: 1) you’re seeing it in a museum, at Buckingham Palace, or reproduced in a book on Leonardo da Vinci and, therefore, you assume this must be worth looking at; 2) you’ve looked at a lot of art and you’ve trained your eye to recognize good work; or 3) you’re an artist yourself, at whatever level of accomplishment. I’m, of course, addressing all of you who fall into categories two and especially three, those of you who really LOOK. Since you’re taking the time to really look and enjoy this drawing, you’ll notice all sorts of lines that appear to be redundant. Some of them are faint, but they’re there. To make them more visible, I placed transparent paper over the drawing and traced these redundant lines. 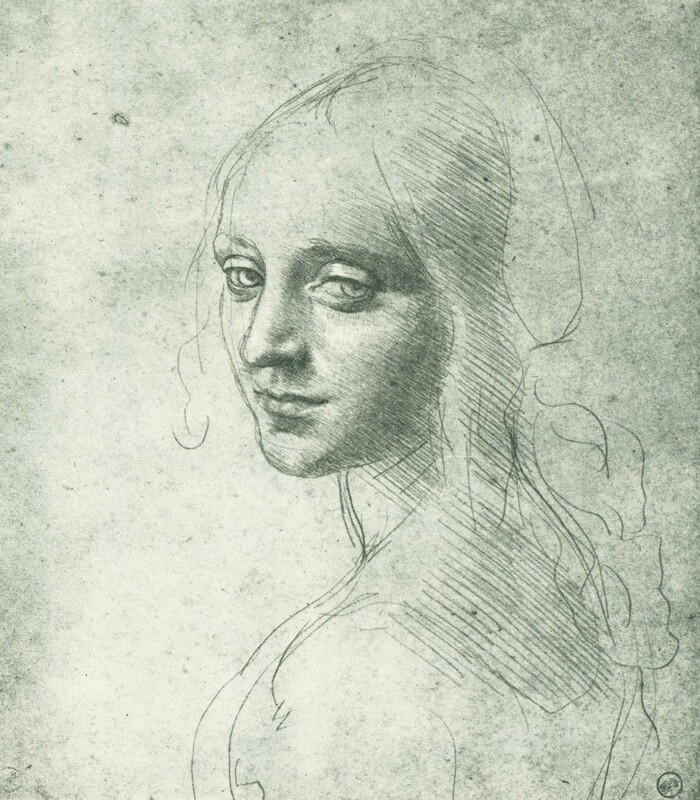 Now, you are fully aware that this drawing of a young woman is by the great Leonardo da Vinci and you ask yourself, quite naturally, if this guy was so great, why didn’t he get the contour of the face right the first time, why are there three lines instead of one line that is sure and RIGHT? And the neck. What’s with all those lines! Hey, Leonardo, you’re so great, just do it! Get it right the first time. We want to admire your greatness. We don’t need to see your hesitation, your thought process, your scribbling, your explorations. But we do. It’s precisely because we see all those apparently redundant lines that we enjoy the drawing. Let’s call them “exploratory lines.” The great Leonardo is exploring. His model has arrived, he sits down at his drawing board, he looks at the young woman and he goes into a state of, let’s call it, wonder. He has drawn hundreds, thousands, of faces before, but not this one, not at this angle, not in this light and not today. He can’t say to himself, oh, yeah, another one of these, I’ve drawn plenty just like it, here’s how we do this. Uh-uhh. If he’s complacent, he’ll blow the whole thing. Instead, he feels that this is an adventure, an exploration. He has to feel the uncertainty that’s at the heart of an adventure. Drawing is like walking a tight rope. The uncertainty heightens his concentration. Instead of thinking of how it’s supposed to look when finished, he enters the drawing process itself. He’s not performing for applause; he’s completely absorbed in the work process itself. He’s working it out. That means he puts down lines that trace his thought process. In that process his perception shifts and his hand follows. The result looks like scribbling. But it’s precisely the scribbling that makes the drawing exiting to look at. Because when we see those exploratory lines we are drawn into Leonardo’s mind and his concentration at that very moment. 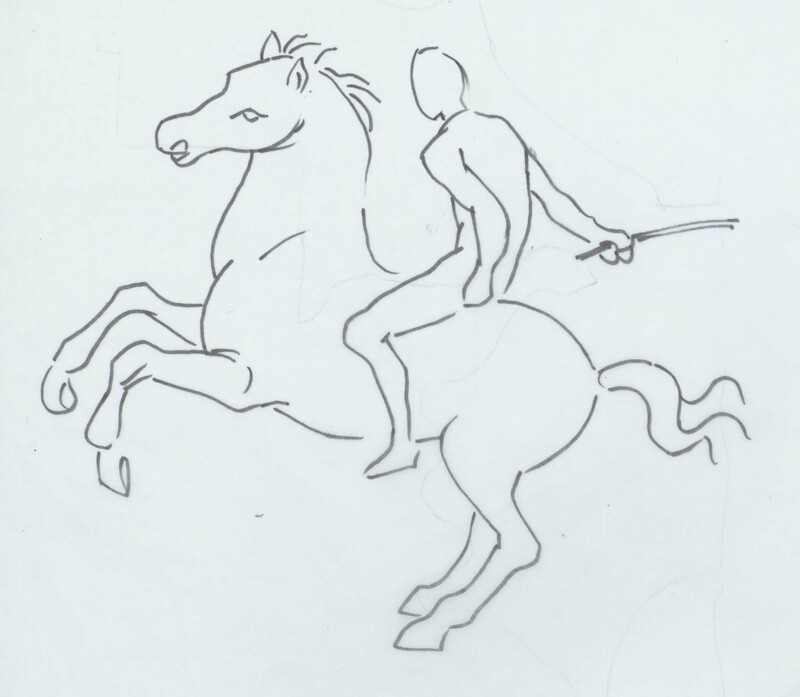 That’s why a clean line drawing of his equestrian statue looks boring and lifeless. 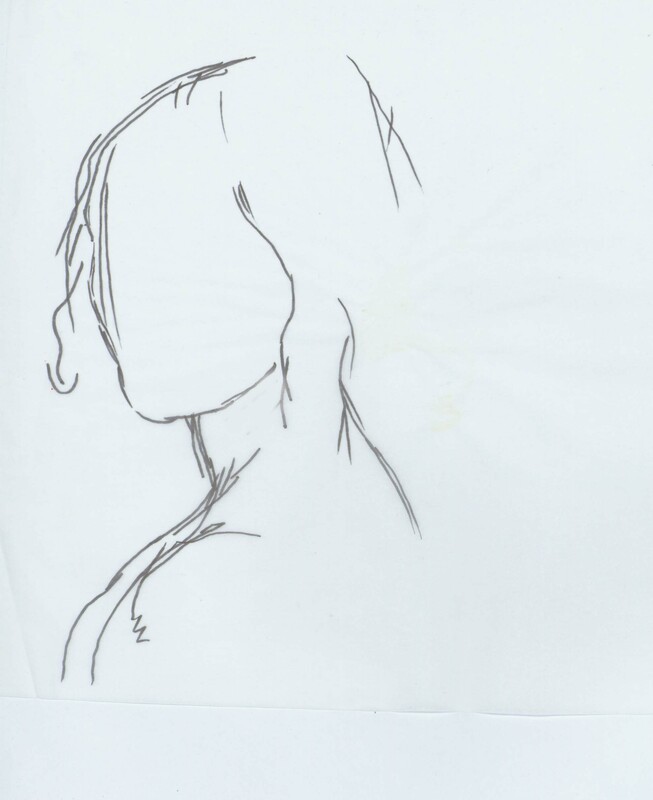 But the sketch in which he worked out the movements and showed all the tracings of his thought process, this “messy” sketch is exiting to look at. The clean line drawing (again, a tracing by me) has all the information, but that’s not why we look at drawings. It’s not information we want, it’s the glimpse into another mind, another sensibility. 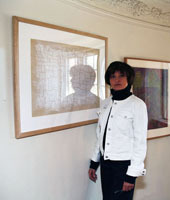 To get that glimpse, we have to be invited to enter into the drawing process itself. A hard point to get across. My students want to produce neat drawings. When I encourage them to scribble and leave the scribbled lines without erasing, I know I’m opposing everything the culture and their past schooling value. This is certainly true of returning, mature students. It is even more true of students in their twenties. Why?! When a teacher encourages you to be “messy,” why can’t you revel in that freedom? One young art major recently enlightened me: most of us, he said, started drawing by copying Manga. We will talk about the crippling influence of Manga in a future blog. 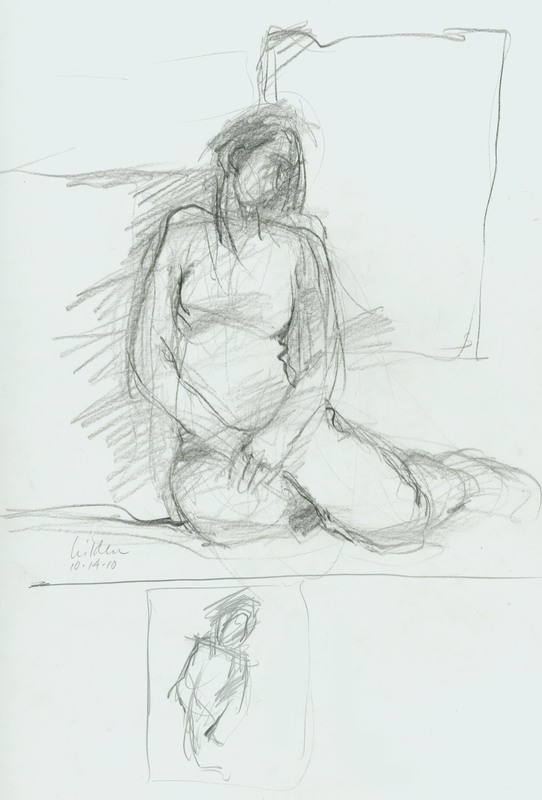 In my class, I recently drew a model while my students stood around me and looked over my shoulder. I drew with a waxy crayon (China marker) that makes erasing impossible. That’s the point. Don’t erase. Let your hand move lightly over the paper, tracing your thought process. As your perception shifts, so does your line. Change your mind and leave the first impression under your new “take.” As you get more and more into the process, your line will become more sure of itself. It will take off. Seeing takes time and seems to occur in layers. Draw for the adventure. Draw for the pleasure of the process itself.